EASTER WEEKEND HOURS AT THE GARDEN	Friday, April 19 and Saturday, April 20 from 10 am to 5 pm, Easter Sunday, April 21 from noon to 5 pm. The last admission ticket is sold at 4 pm. Happy Easter from McKee Botanical Garden. Come enjoy a leisurely stroll through the Garden. Twenty life-scale bronze sculptures from Seward Johnson's Celebrating the Familiar series and his most renowned monumental 25 ft. tall Embracing Peace sculpture are on display throughout the Garden. McKee Botanical Garden is currently accepting photo submissions for the 15th Annual Waterlily Photo Contest through Tuesday, June 11, in conjunction with the 15th Annual Waterlily Celebration to be held on Saturday, June 15, form 8:30 am - 2:00 pm. Sealantro at the Garden Café features an array of hot and cold sandwiches, salads and house made soups, including vegan and gluten free options. A children’s menu is also available every day while groups of 10 or more can pre-order express boxed lunches. 772.794.0601 ext. 111. NOTE: Please no picnicking or outside food is allowed to be brought in. Sealantro at the Garden cafe can accomodate all dietary restrictions. For children ages 3-12, McKee's Garden Discovery Backpacks are perfect for charting your own Garden adventure! Each backpack contains an educational guide and a variety of tools for exploration. Choose from five themes: Garden Explorer, Things with Wings, It's a Bug's World, Plantastic and Survival: Lost in the Jungle. In addition to horticultural beauty, McKee Botanical Garden is a valued resource for cultural enrichment, hosting a variety of programs each season including world-class art exhibits, educational offerings and special events. 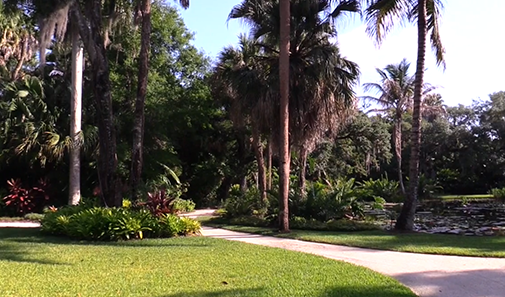 The Garden is listed on the National Register of Historic Places and has been endorsed by The Garden Conservancy as a project of National Significance. McKee Botanical Garden is a private, not-for-profit organization that continues to grow and develop through the support of individuals, foundations and corporations, and from income generated through admissions, gift shop sales and rentals. We look forward to your visit. McKee Botanical Garden is a non-profit 501(c)(3) organization and is supported by tax-exempt contributions. All revenue and membership supports our mission to preserve and sustain our Garden for future generations.